The Kenya Tourism Board (KTB), in its efforts to further promote Kenya as a tourist destination of choice for visitors from the Middle East, is introducing Kenya's luxurious golfing safari packages. The packages will combine the country's African attractions covering the most spectacular landscape, wildlife and historical monuments on the continent, with premium golf experience, one the niche products that Kenya is marketing aggressively. While Kenya is widely recognised across the GCC as home of the original safari, golfing safaris are a relatively new concept which offers keen golfers the opportunity to combine the sport with a relaxing holiday either on the coast, in the city or in one of Kenya’s famous game reserves. John Chirchir, KTB ‘s Regional Marketing Manager pointed out that one of Kenya’s best kept secrets is its numerous golf courses, with many set within some of the country’s most beautiful destinations. 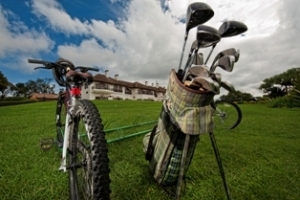 “Golf is increasing in popularity in the Middle East and compared to Asia, Europe or the United States, Kenya can offer golf enthusiasts the world's most desirable courses at a fraction of the cost, while enjoying a unique holiday with their families," said Chirchir. Kenya boasts up to 40 golf courses, the oldest being the Royal Nairobi Golf Club which was founded in 1906, whilst one of the latest is the David Jones designed Vipingo Baobab Golf Club on the coast of East Africa. Located on the slopes of Africa's second highest mountain lying on the equator, the Mount Kenya Safari Club is another exclusive golf property renowned for its luxurious cottages and elegant buildings set amid manicured lawns, which continues to be a favourite destination among well-known international jetsetters. Many of Kenya’s golf courses offer first-class facilities including well-appointed chalets with fine dining restaurants, swimming pools, tennis courts and the most extravagant spa treatments. The golfing courses on the coast also provide access to an array of water-sports activities from glass-bottom boat rides to scuba diving. ‘Magical Kenya’ as it is commonly referred to in the tourism industry, is a land of intrigue, colour and diversity where a Golfing Safari can offer golfers and their families the opportunity to experience and enjoy a variety of leisure attractions. From exploring the bustling capital of Nairobi to relaxing by the Indian Ocean in Mombasa or encountering one or all of the ‘big five’ on an early morning game drive in one of Kenya’s many nature reserves and national parks, a Golfing Safari offers something for every member of the family. In recent years, Kenya’s popularity as a tourist destination for GCC residents has steadily grown. Recent figures released for visitor arrivals from January to September 2012 show a 102% increase with the UAE producing 31,025 visitors compared to 15,357 during the same period in 2011.